Winter Cellar tours are now available to book. At Fenn Valley, we offer our fun and informative tours year around. We believe wine should be approachable. Fenn Valley tours have been designed to help take the mystery out of making world class wine. We aim to strike a balance between education and entertainment. Luckily, the subject matter always keeps things interesting! Our tours are pretty in-depth. They run about 1:45 in length, and involve wine tasting throughout to illustrate the various points being made. During select times of year we also offer specially designed tours involving food and wine. During the cooler winter and spring months our tours take you into the wine cellar and focus on wine making and how various cellar practices influence wine styles and flavors. In the fall, the tours go into the vineyard where the emphasis is on how wine grapes are grown and the kinds of operations that we perform to grow our premium grapes. And during the summer months, we often do a little of both. Note: tours are not guaranteed in the cellar or vineyard. Many factors impact the decision, including weather, equipment availability and guest safety. The cost for our extended tours is $10 per person, which includes a logo glass, yours to keep, and a coupon for $5.00 that may be redeemed with the purchase of four or more bottles of wine. Note: Because wine sampling is included throughout the tour, guests must be over 21 years of age to attend. During fall months (late August-October) we also offer private vineyard tours. 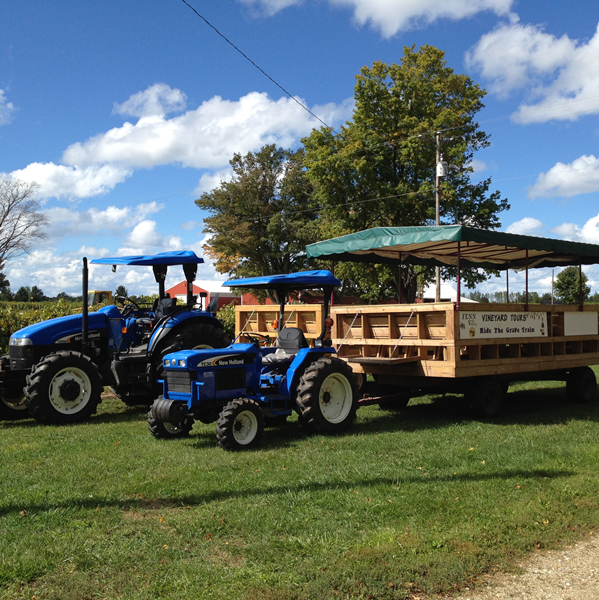 Much like the public vineyard tours, guests travel through the property on specially designed wagons. Wine tasting to illustrate the points being made is also included. The cost for private vineyard tours is $220 for the whole group regardless of group size. These tours can accommodate up to 22 people. Available tours are listed online and are sold on a first come first serve basis. We are unable to accommodate additional private tours during the fall months. If you are interested in a private tour outside of August-November, click here. Please Note: All tour reservations require non-refundable, advance payment. Although our facility is handicap accessible, our vineyard tours are not. All guests on tours must be over 21 years of age with a valid ID.